1. Your feed will be taken over by everything Down syndrome. Assuming you signed up for Down syndrome related groups, you will see plenty of posts on Down syndrome – babies with Down syndrome, kids with Down syndrome, babies recovering from open heart surgery. It can get overwhelming. 2. You will get random requests to friend people you don’t know. The only thing you can imagine is that they just want to watch the circus of your life. Typically they are a friend of a friend whom I’ve never met before. I don’t answer these requests. 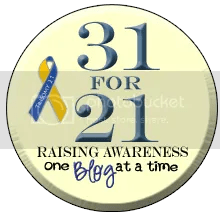 If people want to see the sideshow, they can read my blog and then they’ll see that having Down syndrome in your life is not the tragic hallmark movie they’re looking for but instead interesting in a different way. 3. You will get more ‘likes’. A lot in fact, at least on any picture you post of your child with Down syndrome. If you have any other children, they’re not liked as much. Why so many likes on the kid with Down syndrome? I’m not sure. Some other moms that I know who have experienced the same thing worry that it’s pity. I don’t agree, I think they think my kid is cute, she is a baby after all and everyone loves babies, so maybe that’s the reason for all of the likes. If it does have something to do with Down syndrome I think it’s just their way of showing support, and I welcome it. 4. People will start posting pictures of random kids with Down syndrome on your own wall. As if the millions of pictures of my own kid with Down syndrome isn’t enough. 5. You will have opportunities to connect with other people who are on the same journey as you are, which is so incredibly wonderful. If we didn’t have the internet, then I wouldn’t have anyone to connect with because Down syndrome isn’t on every block in America. As annoying as Facebook can be sometimes, this is one reason why I’m thankful for it. Hahahahahhaa, “People will start posting pictures of random kids with Down syndrome on your own wall. As if the millions of pictures of my own kid with Down syndrome isn’t enough.” YES. Goodness, people. Believe me, I’ve seen it before!